Happy Valentine’s Day! This is not exactly a paleo version of a German delicacy, but it’s really good, so it doesn’t matter. Plus everyone likes Oreos, or at least chocolate. Actually, some people don’t like chocolate, but I won’t acknowledge them. 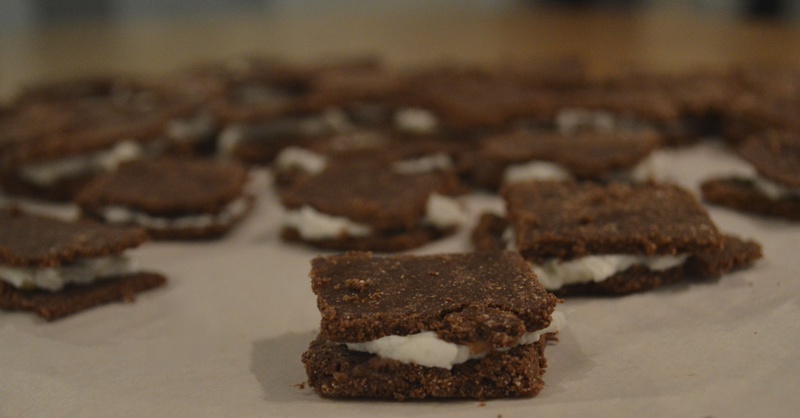 Yesterday, I tried to make The Spunky Coconut’s Chewy Paleoleo’s. Here’s the recipe. She’s a genius! I needed to add an extra quarter cup of dates, 1/8 cup of water, and a teaspoon of coconut oil to get my “cookie” ingredients to stick together. Mine did not turn out nearly as pretty as The Spunky Coconut’s, but they are delicious! “It doesn’t have to be pretty, so long as it tastes good.” I imagine that this is something Julia Child would say. Enjoy!